Derek Butcher 06/15 ... "Note that 'Imbe' is now Al. australiana as described below." Photos by Bruce Dunstan 09/15. TIPO: BRASIL. Rio de Janeiro: Campos dos Goytacazes, Imbe, f. cult. na Australia a partir de semeadura, maio 2013, R. Little s.n. (holotipo: UFRN17095!). DIAGNOSE. This new species is related to Alcantarea extensa (L.B. Sm.) J.R. Grant, but differs by the linear triangular shape of the leaf blade (vs. ligulate in A. extensa), longer (> 120 cm vs. <110 cm) and stouter peduncle, which usually is purplish to almost black (vs. green to reddish wine red), 1.5-1.75 m wide inflorescence (vs.0.3-0.5 m) bearing larger number of branches (11-18 vs. 1-9), sterile and floral bracts predominantly green or yellowish green (vs. castaneous), narrower (2.5-3.5 cm), slightly gibbous, paleaceous and elliptic floral bract (vs. wider 3.5-4.6 cm, gibbous, coriaceous, broadly ovate), longer petals (12-13 vs. 8-9 cm) and longer filaments (11-13 vs. 7-9 cm). TYPE: BRASIL. Rio de Janeiro: Campos dos Goytacazes, Imbe, f. cult. na Australia a partir de semeadura, maio 2013, R. Little s.n. (holotype: UFRN17095!). RUPICOLOUS (1.8) 2.3-3.2 m alt., short-caulescent. ROSETTE 0.6-0.95 x 1.2-1.7 m, robust, infundibuliform, water retention developed. TIP OF BLADE sharp, acuminatea, green, generally recurved, rarely twisted. BRACTS proximal: subfoliaceous and suberect; the median and distal 8-10 x 5.5:-7 cm, ovate to wide-ovate, tip acuminate, green, with vinous spots at the base and the tip, usually waxy on the abaxial face, subdensely brown lepidote on both sides, erect to suberect, involute, accumulating a little water in the distal base often hiding beginnings of stunted branches, distinctly nerved, coriaceous, margins membranaceous, hyaline-yellow. FLORAL BRACTS 3.1-3.9 x 2.8-3.8 cm, elliptic to rounded, tip obtuse, paleaceous in sicco, yellowish green in vivo, glabrous abaxially, glabrous to sparsely brown lepidote in direction to the tip adaxially, partially enclosing the calyx, suberect, finely nerved-rugose in sicco, chartaceous, ecarinate, slightly gibbose, margins membranaceous, hyaline yellowish. OVARY ca. 13 mm (portion superior) x 6 mm, narrow ovoid, whitish green. BASAL COMA ca. 6 mm, beige; APICAL COMA ca. 10 mm, beige. DIAGNOSIS. This new species is related to Alcantarea extensa (L.B. Sm.) J.R. Grant, but differs by the linear triangular shape of the leaf blade (vs. ligulate in A. extensa), longer (> 120 cm vs. <110 cm) and stouter peduncle, which usually is purplish to almost black (vs. green to reddish wine red), 1.5-1.75 m wide inflorescence (vs.0.3-0.5 m) bearing larger number of branches (11-18 vs. 1-9), sterile and floral bracts predominantly green or yellowish green (vs. castaneous), narrower (2.5-3.5 cm), slightly gibbous, paleaceous and elliptic floral bract (vs. wider 3.5-4.6 cm, gibbous, coriaceous, broadly ovate), longer petals (12-13 vs. 8-9 cm) and longer filaments (11-13 vs. 7-9 cm). DISTRIBUTION, ECOLOGY AND CONSERVATION. Alcantarea australiana is known from two collections only, both from the city of Campos dos Goytacazes, Rio de Janeiro's northern region. Originally, seeds were collected in the District of Imbe in fields, and taken for cultivation in Australia. Other examples also were collected in the same city, but in the region of Morro de Itaoca. New studies in field is needed to evaluate the state of conservation, in spite of the collectors indicating that the populations are large, the region of morro do Itaoca has been suffering with the impacts of mining. PHENOLOGY. Was collected with fruits in May. ETYMOLOGY. The choice of the name has a double meaning: it pays homage to Australia, where parents of the new species were grown and initially studied by collector Robert Smythe, and for being in the A. extensa complex with a more southern distribution, reaching the State of Rio de Janeiro. DISCUSSION. This new species described here shows that for a decade it has been cultivated in Australia, from seed collected in Brazil. It was being treated as a cultivar, Alcantarea "Imbe", which refers to the Type location. The description here prepared is based on material cultivated in Australia. However, the existence of a species of monumental Alcantarea, in the region, North of Rio de Janeiro, already had been indicated by other collections (Forzza 5129 RB, SP), obtained in the region of morro do Itaoca, in the same city (Pl. 9h), but with past inflorescences. This specimen was identified by Versieux (2009) as affinis A. patriae, because of leaf morphology and a branch of the inflorescence. 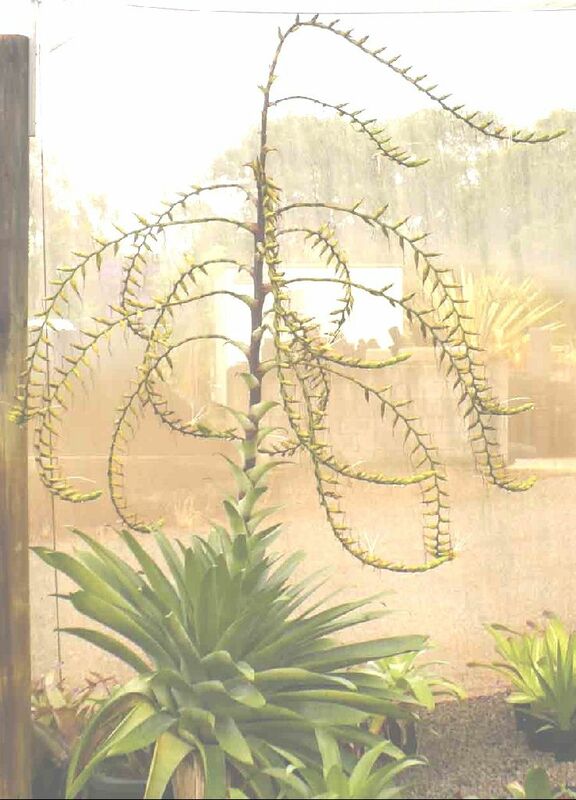 However, after analysis of flower material in cultivation, it was observed that the flower has typical features of the complex A. extensa (Versieux & Wanderley 2010) and is distinguished from all others by its inflorescence which is wider than long, with long branches. It is species with great ornamental potential, especially for the divaricate stamens, which assume position almost entirely radial and delimiting a circle of ca. 10 cm of diameter. 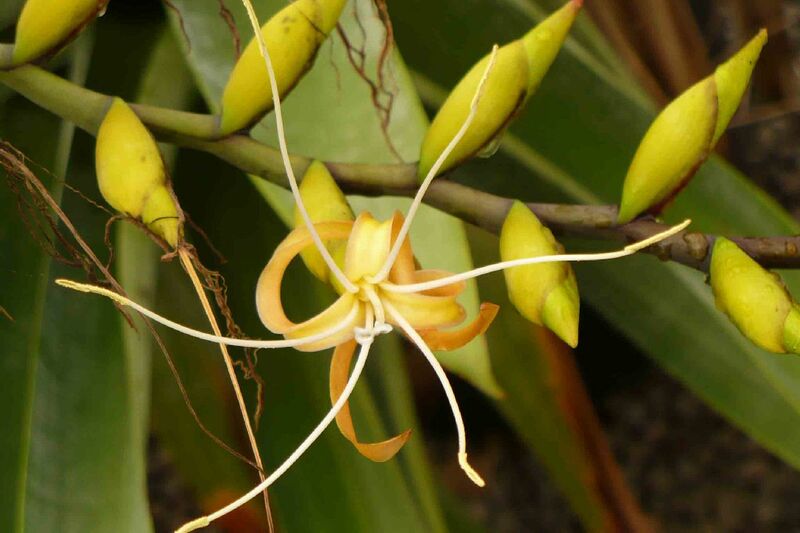 The nocturnal flowers are odorless and the position of the stamens suggest pollinisation by bats. In connection with growing aspects, the species differs from other A. extensa complex by having attenuate leaves more densely arranged and with acute tip. PARATYPE: Brasil. RIO DE JANEIRO: Campos dos Goytacazes, Morro do Itaoca, 27 May 2008, Forzza et al. 5129 (RB, SP).